MERIA HELLER — why not speak loudly AND carry the big stick? and seen films disproving it. media to keep Americans in the dark." MERIA HELLER, 59, lives in Phoenix. A native of New York City, she did radio in Phoenix for one and a half years, then moved to the internet in July of 2000.The past nine years she has been the producer and host of the longest, strongest podcast on the net at www.Meria.net. Before the world went mad, Meria made her living teaching practical spirituality and as a watercolorist. She was listed in the "Who's Who of Living Artists in America." In July 2000 Meria realized the important of a Bush win and became extremely political to stop a Bush administration, knowing the environment and the country would suffer tremendously under George W.
The show then took on a life of it's own with the best people on the planet as guests. All shows for all the years are archived on site for an education that is top rate. Meria has also written three books and spoken worldwide at many different conferences, some available on Google. To win a round button that says, "Bush Is Lying About What He Knew," be the thirteenth pastel portrait painter in Taos to correctly answer the following. NAD: Meria, hello, thank you for taking the time for this. Where did you grow up? What was the name of your high school? Grew up in Brooklyn, New York, went to Thomas Jefferson High School (perhaps an omen of my Jeffersonian work). Who knows, paid no attention to sports, just there for the learning. and I love a good mystery." NAD: How did you get out to Arizona? The subway doesn't go that far, or does it? It was time to leave NYC and try something else. packed up the family and away we went. Been here since 1991 can't see leaving. NAD: How did you get started in radio? My biz partner in Vegas needed a show to advertise her golf outings, and I joked I can do it. She gave me money to go buy time, and voila' I was on the radio. After our contract was up, I was asked to stay since my show brought the listeners in. I did stay for a while. 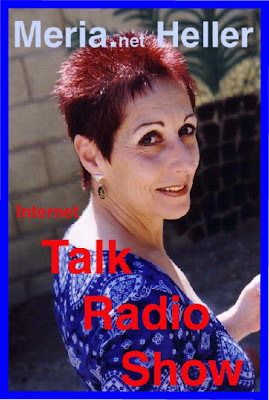 A day after I left radio, I was approached to do Internet radio. Thought I'd do it for fun for a few months, and I'm still here with a show that took on a life of it's own. NAD: And how did you get into the realm that you are in? My vision showed me the disasters awaiting all of us and the planet if Bush got in, so I immediately started doing the homework and switched the theme of the show. As an environmentalist I knew we didn't have four or eight years to lose. The more I learned the worse it got, the deeper the rabbit hole. It's one big puzzle and I love a good mystery. until I saw them when a ship I was on got stuck in the Bermuda triangle. I wasn't the only one that saw them hovering about the ship. I'd like to answer them all. I never believed in UFOs being real until I saw them when a ship I was on got stuck in the Bermuda triangle. I wasn't the only one that saw them hovering about the ship. Not pleasant. I doubt this strongly, having done the homework and seen films disproving it. Bush is too stupid to knock down anything but himself. I think he was an unknowing participant in the fall of the towers. Yes, four bombs were taken out of those buildings, not one. Yes, Waco was Clinton's experiment on how much the American people would take, and how stupid we are. There is an intelligent force of which we are a part. As Buddha says "God is the ocean and we are each a wave". When humans realize they are gods, they will change their reality. Many years of spiritual journeying, and some great teachers. Toss in my intution and there you have it. I know that what I do, and can do is my godself which is all knowing and indestructible. This world has been in the hands of the worse scum of the universe for way too long. We need to realize our god-selves and snap out of the matrix. It's time to change the reality set in place by others, and create our own. and how stupid we are." No, not a drop. He is a puppet of those who financed and created him. It's obvious by his cabinet picks. I put no hope in any man or politician, I put it in everyman. NAD: What happened to Kucinich, Nader, McKinney, Paul — and why did they not have a chance? They are not members of any secret society or lobbying group, nor a slave of Israel, so they had no chance. NAD: Who decided our candidates would be Obama and McCain anyway? The international banksters who run the whole planet, they never lose. Until we pick the candidates and take back our money supply, nothing will change. "... not a drop. He is a puppet of those who financed and created him. " I have done so many things, I've forgotten a lot of them. I had a one-woman show of my paintings in Soho, NYC. I have been published widely in magazines and have three books out. I've taught children how to respect nature at the Desert Center in Scottsdale, Arizona. I've taught watercolor and metaphysics in colleges in NYC and in Arizona. I've raised two kids; created a new paradigm in media; succeeded at a pay-to-listen model on my show despite people saying it would never work. I would like to get back to teaching children, love to do more public speaking engagements and maybe learn to play the piano. I eat vegetarian, pretty healthy, drive a Prius (of course) and drink lots of water and iced tea I brew myself. Occasionally a glass of cabernet. Today I'm off to the gym for a hard workout. Pajamas, I have many many pairs, prefer to stay in them as long as possible during the day! Check my tons of email before I leave for the gym. Not a thing, just keep doing what I do. NAD: How cool is it to be on the radio and broadcasting around the world? It's pretty cool, but I see it as my "work." Personal accolades make me uncomfortable, and I don't like being likened to an "angel" etc. I am just an ordinary person doing extraordinary things. I love the fact that people worldwide respond to my work, my accent, and my dry sense of humor. Many of my subscribers have been with me from the start! The same people that will cause the end of it, the international banksters and the Illuminati and all their secret societies intent on a one world order, or as I call it "one world disorder." NAD: Why do gas prices fluctuate? Price manipulation plain and simple. It's always been the case. NAD: Is there any difference between American mainstream media and Tass, Pravda, in the days of the Soviet Union. American media is Pentagon/Cia media to keep Americans in the dark. I have little faith in Pravda's news these days, too. Most of it is disinformation (as are a lot of so-called progressive media) and fear mongering. I don't know. This is pretty thorough. Maybe "what would you do with a million bucks?" I'd reinvest it in my show and open it up to the world (archives and all, all 3,000 hours) for FREE and the world would change on a dime. NAD: Please insert a link here to something you would like linked to, with a brief tag re: where that link goes. My site, loaded with the best, uninterrupted information you can find on the planet, for the pittance of $14.95 a month! All downloadable too. Thank you Mike, I hope this is what you were looking for. "Teaching children about our interconnectedness to all living things in a circle of stones on the ground, a medicine wheel, and helping the world become a better place."